18K. 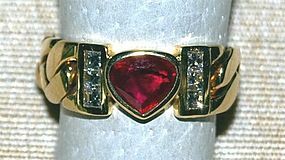 Solid Gold Chain-Link Ring (flexible) set with one genuine heart shaped Ruby @ 1.04 ct and 6 square Diamonds @ 0.28 ct. total weight. 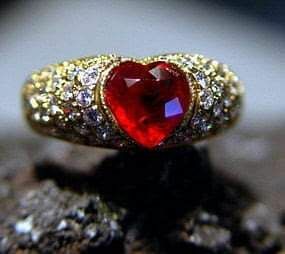 Stupendous Heart Ruby and Pave Diamond Ring 18K. 18K. 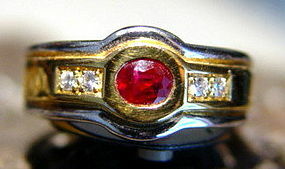 Solid Gold Ring set with one absolutely stunning and rare fire-red Genuine Siam Ruby @ 2.02 ct. and 58 Pave set Brilliant Diamonds @ 1.13 ct. total weight. Solid 18K. 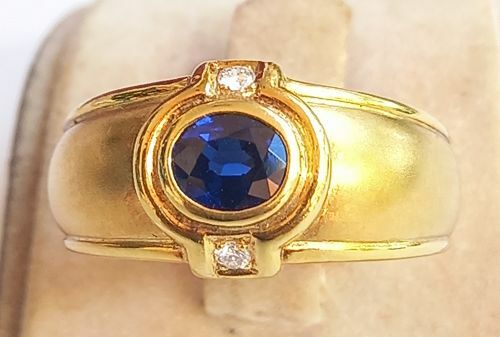 Gold Ring (3.42 grammes) set with one Genuine Ceylon Blue Sapphire @ 1.53 ct. and 26 Brilliant cut Diamonds @ 0.21 ct. total weight. Solid 18K. 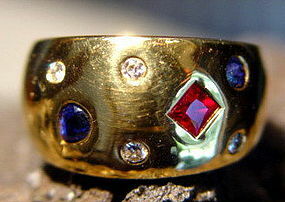 Sandblasted Gold ring set with one Genuine Blue Sapphire @ 0.84 ct. and 2 brilliant cut Diamonds @ 0.04 ct. total weight. Solid 18K. 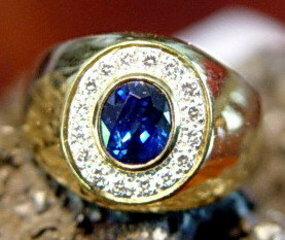 Gold ring set with one Genuine Blue Sapphire @ 0.88 ct. and 33 Brilliant Diamonds @ 0.26 ct. total weight. Solid 18K. 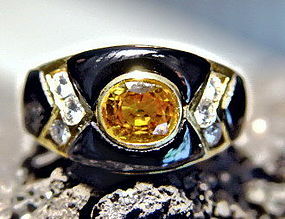 Gold Ring set with one Genuine Ceylon Yellow Sapphire 1.09 ct., 6 Brilliant Diamonds @ 0.28 ct. total weight and hand carved Black Onyx. 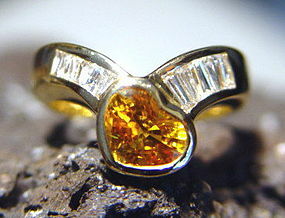 We have 2 of these rings in stock! Solid 18K. 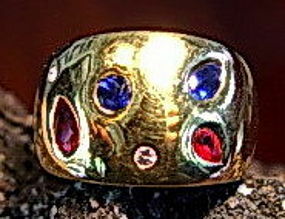 Gold ring (3.83 gr.) 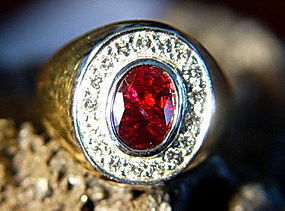 set with one Genuine Thai Ruby @ 0.34 ct. and 6 square Diamonds @ 0.16 ct. total weight. Solid 18K 2-Tone White and Yellow Gold Ring set with one Genuine Thai Ruby @ 0.36 and 4 brilliant Diamonds @ 0.07 ct. total weight. Solid 18K. 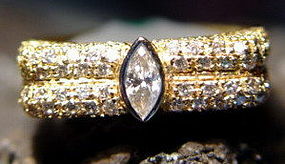 2-Tone Gold Ring set with 114 Diamonds @ 0.86 ct. total weight. Solid 18K. 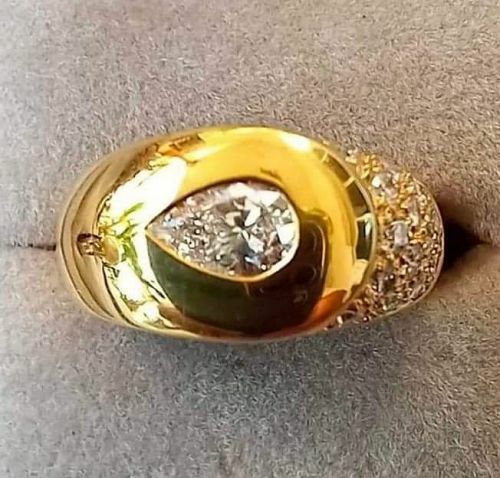 Gold Ring (5.11 grammes) with fine white Pear shaped Diamond @ 0.40 ct. and 14 Brilliant Cut Diamonds @ 0.30 ct. total weight. 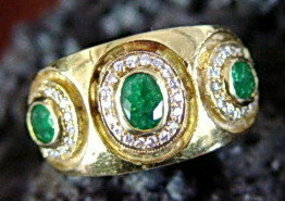 A wide band solid 18K. 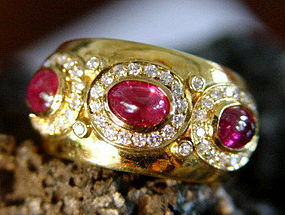 Gold Ring set with 3 Genuine Cabochon Rubies @ 1.63 ct. total weight and surrounded by 52 brilliant cut Diamonds @ 0.35 ct. total weight. 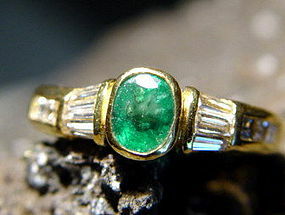 Stunning 18K. 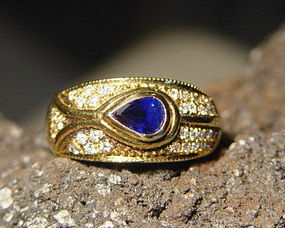 Solid Gold Ring set with one Genuine Ceylon Blue Sapphire @ 1.40 ct. and 16 Brilliant Diamonds @ 0.27 ct. total weight. Solid 18K. 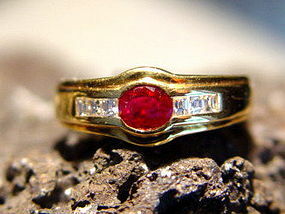 Gold Ring set with one Genuine Thai Ruby @ 1.18 ct. and 17 Brilliant Diamonds @ 0.33 ct. total weight.